Ninety miles from the South Eastern tip of the United States, Liberty has no stead. In order for Liberty to exist and thrive, Tyranny must be identified, recognized, confronted and extinguished. Turns out, the best drinking stories in history are actually, well, historical. So raise a glass to your forefathers and marvel at these tales. Think you can drink like a sailor? Maybe you should take a moment to reflect on what that truly means. 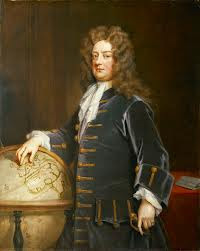 The record for history's largest cocktail belongs to British Lord Admiral Edward Russell. In 1694, he threw an officer's party that employed a garden's fountain as the punch bowl. The concoction? A mixture that included 250 gallons of brandy, 125 gallons of Malaga wine, 1,400 pounds of sugar, 2,500 lemons, 20 gallons of lime juice, and 5 pounds of nutmeg. A series of bartenders actually paddled around in a small wooden canoe, filling up guests' cups. Not only that, but they had to work in 15-minute shifts to avoid being overcome by the fumes and falling overboard. The party continued nonstop for a full week, pausing only briefly during rainstorms to erect a silk canopy over the punch to keep it from getting watered down. In fact, the festivities didn't end until the fountain had been drunk completely dry. The Industrial Revolution wasn't all steam engines and textile mills. Beer production increased exponentially, as well. Fortunately, the good people of England were up to the challenge and drained kegs as fast as they were made. Brewery owners became known as "beer barons," and they spent their newfound wealth in an age-old manner -- by trying to party more than the next guy. After the dinner, the vat was filled to its 4,000-barrel capacity. Pretty impressive, given the grand scale of the project, but pretty unfortunate given that they overlooked a faulty supporting hoop. Yup, the vat ruptured, causing other vats to break, and the resulting commotion was heard up to 5 miles away. A wall of 1.3 million gallons of dark beer washed down the street, caving in two buildings and killing nine people by means of "drowning, injury, poisoning by the porter fumes, or drunkenness." The story gets even more unbelievable, though. Rescue attempts were blocked and delayed by the thousands who flocked to the area to drink directly off the road. And when survivors were finally brought to the hospital, the other patients became convinced from the smell that the hospital was serving beer to every ward except theirs. A riot broke out, and even more people were left injured. Sadly, this incident was not deemed tragic enough at the time to merit an annual memorial service and/or reenactment. Northeast Passage. A near mutiny forced him southward, and upon reaching land, he encountered members of the Delaware Indian tribe. 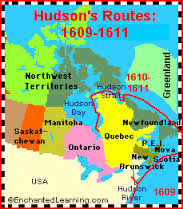 To foster good relations, Hudson shared his brandy with the tribal chief, who soon passed out. But upon waking up the next day, he asked Hudson to pour some more for the rest of his tribe. From then on, the Indians referred to the island as Manahachtanienk -- literally, "The High Island." And not "high" as in "tall;" high as in "the place where we got blotto." Most people would agree that Manhattan has stayed true to the spirit of its name ever since. In 1805, British Admiral Horatio Nelson was killed during the Battle of Trafalgar off the coast of Spain. Most sailors were simply put to rest at sea, but as an admiral, Nelson had to be brought back to England for an official burial. 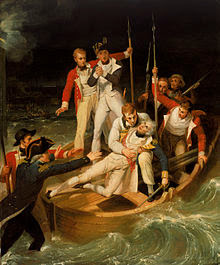 To preserve his body during the voyage home, the second-in-command stored Nelson's body in the ship's vat of rum and halted all liquor rations to the crew. Not a bad idea, but when the ship reached port, officials went to retrieve Nelson's body and found the vat dry. Disregarding good taste (in every sense), the crew had been secretly drinking from it the entire way home. After that, naval rum was referred to as Nelson's Blood. No wonder they don't sell beer at the circus. 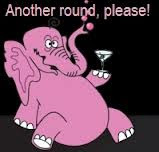 Apparently, elephants like to get wasted. In fact, an outpost of the Indian army in the jungle region of Bagdogra has been under attack ever since a local herd of elephants raided the base in search of food and discovered the soldiers' entire winter rations of rum. Since then, the pachyderms have regularly raided the base for a drink and have smashed down all defenses put up by the army, including electrified fences and firewalls. According to The Daily Telegraph, "An officer recently posted there explained that the elephants broke the rum bottles by cleverly curling their trunks around the bottom. Then they empty the contents down their throats. They soon got drunk, he said, and swayed around. They enjoy themselves and then return to the jungle." This is by no means a singular incident, though. The animal kingdom is well-known for its ability to identify fruit that's begun to ferment. Anthropologists even believe this is how early man discovered alcohol -- by observing the strange behavior of animals on a fruit bender. Every Day Life In America..
A Clinton Telling The Truth?? Is Brainless The Same As Beheaded? Orwell's "1984" vs. Huxley's "Brave New World"
Don't Open Your Door In A Carwash! Do I Need A 100 Mag Drum? Are You Feeling Lucky Punk? Who Is The Bigger Threat To America? Was Robert Mueller Colluding With Russia? "...we were sent halfway across the world to help protect people just like Omar and her family. Nineteen incredible men gave their lives defending her country while serving ours." "10 Marcus Aurelius Quotes That Are Still Relevant Today"
Sri Lanka terrorism attacks retaliation for New Zealand mosque shootings. Hey Millennials You Want To Know About Climate Change? This Should Warm You Up ! No words . . .
A bit late with this one. We're #1! Again! Yup, Essex County, NJ has the highest property taxes in the nation! Guess What? You're a Racist! Obama the first Jewish President? 90Miles. Simple theme. Powered by Blogger.